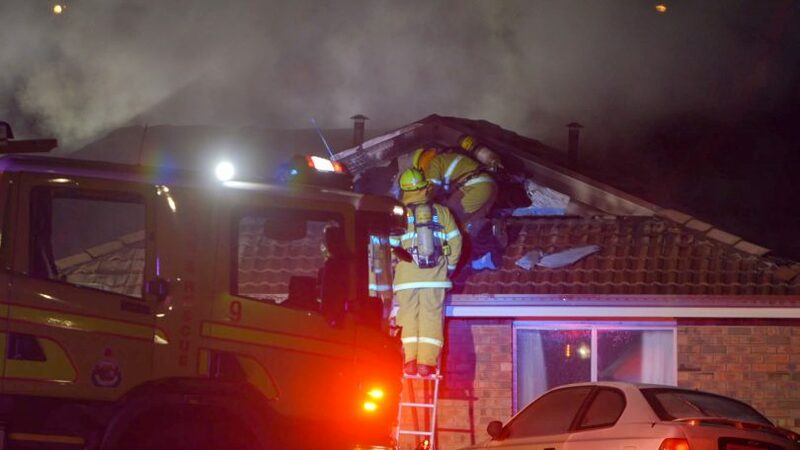 Firefighters have rescued a pregnant woman who was trapped in the backyard of her Nicholls home after a suspicious fire tore through the house overnight. Just after 2 am, the woman fled into the backyard of her home on Dooland Court, Nicholls after the fire broke out. The woman rang 000 after she could not find a safe exit from the yard. Firefighters in the Communication Centre spoke with the women over the phone until firefighters found her in the backyard and moved her to safety. ACT Ambulance Service intensive care paramedics assessed and treated the woman at the scene. Crews remained at the scene on Thursday morning (23 August) to extinguish hotspots throughout the three-bedroom property. 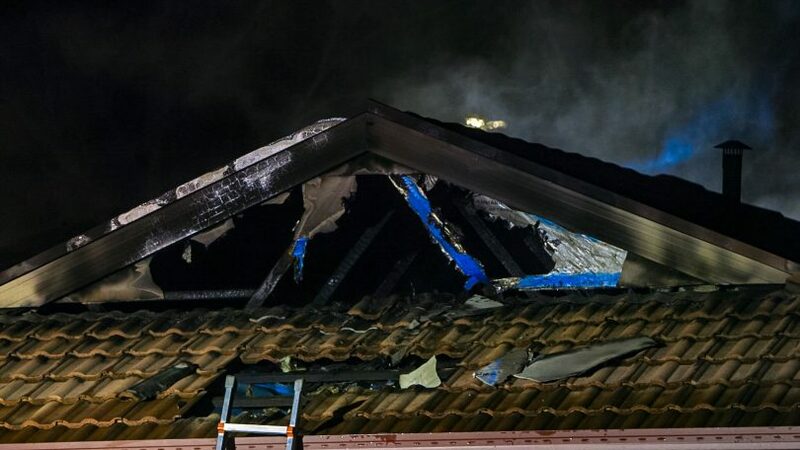 An ACT Policing spokesperson said the cause of the fire has been deemed suspicious, and police are now investigating the circumstances of the incident but would provide no further comment. 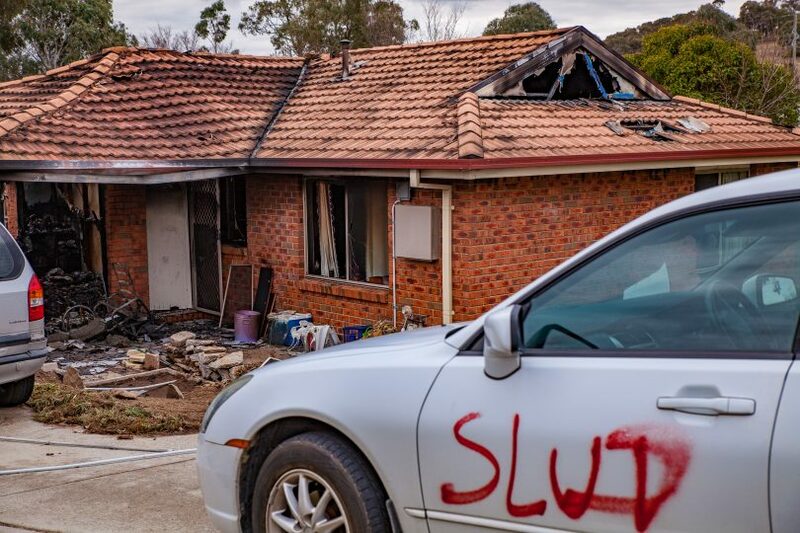 An abusive slur was written in red paint on a white car that was parked in the driveway this morning as ACT Policing was at the scene. Anyone who witnessed the incident, or who has any information that could assist the investigation is urged to contact Crime Stoppers on 1800 333 000, or via the Crime Stoppers ACT website, quoting reference 6300623. Congratulations to the fire fighter who guided the lady out of the smoke logged house over the phone. It's the intention of the act emergency services agency to have generic civilian call takers answering these 000 by October, might be a different outcome next time. It makes me feel sick to my stomach that someone could do this to another human being - let alone a woman carrying a baby 😓😭 I’m so glad she got out physically ok!!! And I hope that she is offered the world in respect to a SAFE home, and belongings to replace what was taken from her!! ❤️❤️ I would definitely donate to that GoFundMe!! !